The year was 1867; the Navajos had returned from Bosque Redondo to their homelands near Fort Wingate, New Mexico, when Hosteen Klah was born to Hoksay Nolyae and Ahson Tsosie. Growing up, Klah avoided attending boarding school, but received training in weaving from his mother & sister while being trained by his uncle in chanting & sandpainting. Klah was able to master at least eight chants; normal was one or two. 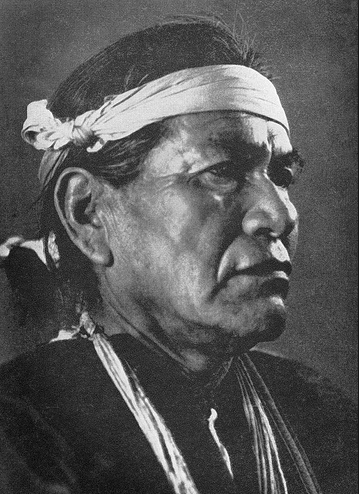 He mastered the Hailway, the Mountainway, the Nightway, the Windway & the Chiricahua chants. Klah is commonly believed to be an intersexed individual & this element helps explain his ability to be a weaver, considered a female role, & a chanter, considered to be a male role. He was recognized as an important Medicine Man by 1917. After 24 years studying, he could perform the nine-day Nightway (Yeibichai) ceremony perfectly, chant and symbol, establishing himself as a great singer. Klah is known for his sand painting weavings, notonly because he was a man weaving them, but because he was making permanent images of sand paintings from chants he knew, something which was not accepted policy for Navajos. He decision to do this was decided by a lack of enough apprentices to whom he could teach his chants. Sand painting weaving was a way of keeping the chants from being lost. He did it with great caution, in fear of upsetting the deities who would be evoked in these permanent images. During his life journey, he developed a deep & lasting friendship with Mary Cabot Wheelwright. Together, they formed the Museum of Navajo Ceremonial Art in 1937, known today as the Wheelwright Museum. Most of his sand painting weavings are in its collection. We are truly fortunate that what is believed to be his first sand painting weaving, is here on display in the Heard’s permanent collection. This weaving from 1921 is what is called the Whirling Log design from the Nightway ceremony, donated to us by Read Mulan. Hosteen Klah died of pneumonia Feb.27,1937 and is buried on the grounds of the Wheelwright Museum.